21 Mar : India on Sunday became the first country to have a ‘manoeuvrable’ supersonic cruise missile when it successfully test-fired the vertical-launch version of 290-km range BrahMos from a warship in the Bay of Bengal off the Orissa coast. “The vertical-launch version of missile was launched at 1130 hours today from Indian Navy ship INS Ranvir and it manoeuvred successfully hitting the target ship. It was a perfect hit and a perfect mission,” BrahMos aerospace chief A Sivathanu Pillai told the news agency. After today’s test, India has become the first and only country in the world to have a “manoeuvrable supersonic cruise missile in its inventory,” he said in New Delhi. In separate messages, President Pratibha Patil and Defence Minister A K Antony congratulated the BrahMos scientists and the navy for the successful test-launch. Pillai said the software of the missile was improved andtoday’s test proved its capability of manoeuvrability at supersonic speeds before hitting the target. “During the test, the missile hit a free-floating ship piercing it above the waterline and destroying it completely,” BrahMos officials said. The test-firing was part of the pre-induction tests by the Navy as moves are afoot to deploy the vertical-launch version of the missile in ships. The weapon system has been designed and developed by the Indo-Russian joint venture company. All the three Indian Navy’s Talwar class ships, under construction in Russia, have been fitted with vertical launchers and many other ships will also be equipped with them, officials said. The navy had earlier carried out several tests of the BrahMos but most of them had been done from inclined launchers abroad INS Rajput. The missile is already in service with the Navy and its Shivalik class frigates have been equipped with it. 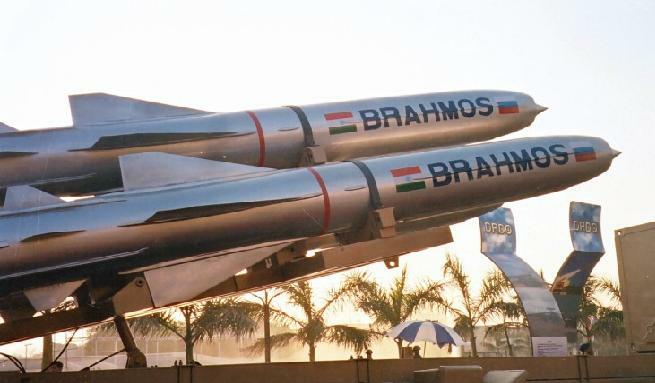 BrahMos has also been inducted into the Army and preparations are on to develop its air-launched and the submarine-launched versions, officials said.